Researchers at the University of Groningen in the Netherlands have developed a 3D printed plastic that is able to destroy 99% of bacteria that come into contact with it without causing any harm whatsoever to humans. 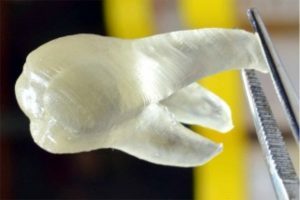 This amazing plastic can have a wide range of applications, but what’s most interesting is that it can be used to 3D print teeth and braces. According to their article “3D-Printable Antimicrobial Composite Resins”, the team of scientists managed to embed antimicrobial quaternary ammonium salts inside existing dental resin polymers. The salts are positively charged and so disrupt the negatively charged bacterial membranes, which causes them to burst and die out. The mixture was hardened by using ultraviolet light and then the team printed out a whole range of dental objects. In order to test the plastic’s antimicrobial properties, the scientists covered the 3D printed samples with a mixture of saliva and Streptococcus mutans, the bacterium that causes tooth decay, and found that the material had killed over 99% of the bacteria. Although the scientists are convinced that the applications of the 3D printed plastic could be extended greatly, they do admit that further research and further testing are needed in order to be sure that the material will be strong enough to be used as an actual tooth. Further tests are also needed to evaluate whether the material would be compatible to have the same effects on bacteria if it were used for other products such as toothpastes or retainers. “The antimicrobial properties were shown to be caused by bacterial contact killing with the material rather than the release of antimicrobial compounds from the resin. Having optimised the activity and stability of these materials, we have a prototype at hand that is suited for further testing in a clinical setting, including not only dental applications but also, for instance, orthopaedic ones like spacers and other polymeric parts used in total hip or knee arthroplasties,” the researchers write.